If you have seen me around any of the Facebook groups – you HAVE to have seen me post a version of my Charleston Dress by Hey June. I have now made THREE versions of the dress, and have decided to share my first TWO versions with you! As a part of the #watchawearinjanuary blog tour, we are showcasing what we are wearing in our climates, and/or for where we are headed. I work in a business professional setting, so the ability to throw on a blazer with a nice dress (albeit, with a pair of boots, given its been approaching/below freezing), is worth its weight in gold. 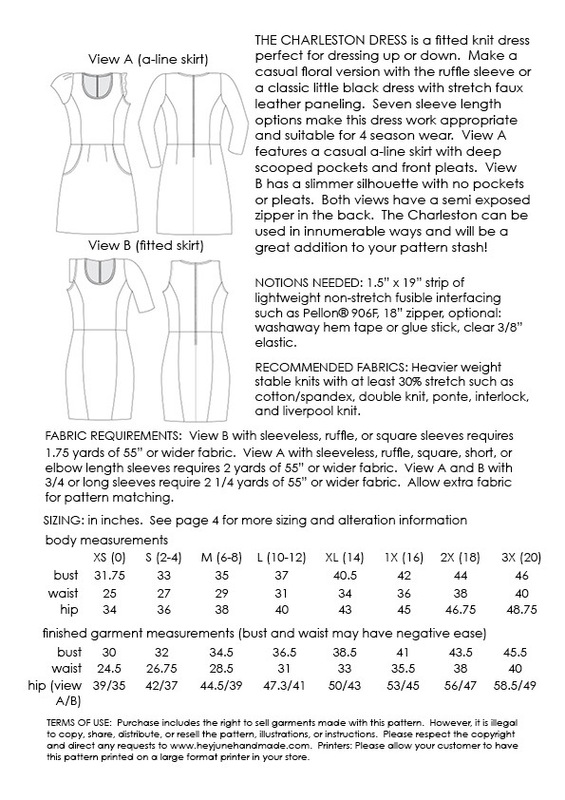 I used a Liverpool (aka polyester spandex doubleknit) fabric that I had purchased from Denver Fabrics. As it was my muslin, I didn’t worry too much about construction and that CLEARLY SHOWS (ummm… hello large seam down the front of the skirt — please remember to cut this piece on the FOLD if you are making it for yourself!). There are nice DEEP pockets, the fit is comfortable, yet flattering, and in a stretchy enough material – you can cut the back on the fold, and omit the zipper altogether -SWEET! As this was my first foray into florals – you can see I thought pairing it with a neutral solid cardigan helped to tone down the dress! For my second version, I used another floral, but this time out of a scuba (far more stable) knit from Knitpop! Ohhhh how I adore Knitpop! Those mystery boxes can be ADDICTIVE (now I get why folks love to receive Stitch Fix boxes – it’s like Christmas at every delivery – especially when you aren’t sure of the contents). This V neck is far more pronounced than I intended, but I kind of like it that way! At first I thought I did something wrong because my v would not lay well, but topstitching made ALL the difference! Well – that’s all I have for now! If you enjoyed the review – please let me know below! Also, don’t forget to click through to the other bloggers pages to learn more about what we are wearing in January! There’s a Rafflecopter that makes you eligible to win an outrageously good prize – what do you have to lose? If you’re ready to be inspired, feel free to begin clicking through our HTML for this week. Obviously, posts go live on their date. Check out the AMAZING Sponsors!!! The charleston is such a great “work” dress. Enough options to keep it different each time. You could wear a different one every day and no one would even notice it was the same pattern. Thanks for sharing these! Ive wondered how difficult this pattern was for a while. They look beautiful! I love this! The dress has great lines and I love the pockets. Great job! Love the blue dress. Both dresses look very nice on you.